DISCLAIMER: Neutrogena sent us this product for review, but all expressions are mine. My beatiful and young-looking mami and me in Thanksgiving Day 2015. It’s no secret that I’m an only-child – I’m a mami’s girl. She’s my biggest fan and I’m hers. That includes feeling VERY proud everytime someone compliments her on how fabulous and young she looks. It’s also no secret that my mami works HARD to look as young as she does. Her routine includes a mile run at least four days a week, eating healthy, a weekly visit to the beauty salon and of course – a true commitment to her facial regime. As a P.A.N.K (professional aunt, no kids), I’m always looking into what’s new in beauty so I can stay as young and pretty as my mami. Even though she inspires (and pushes!) me to keep up with my routine, I confess I’m not as disciplined as her. I decided that I wanted to share this anti-aging knowledge with the mothers, grandmas and tias of Los Tweens & Teens. Siiiiii – you’re welcome! 2. After your cleansing, be sure to follow with a facial toner. So many of us, especially ‘las millennials’ forget about toner and it’s so important for your skin to balance correctly after cleansing. 3. Use a serum for eye cream. Gently massage the eyes for 1 minute with soft circles using the index finger and middle fingers. Do 3 sets of 15 reps to really feel the difference. 4. 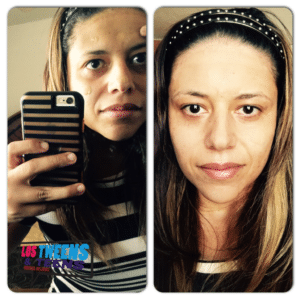 Do facial yoga! 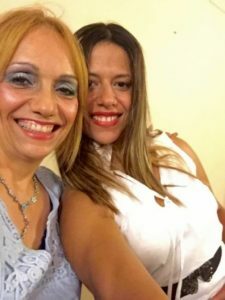 Yes – my Mami’s routine includes 12 different movements for each part of the face (lips, neck, forehead, etc) doing 3 sets of 15, for a total of 45 reps. Use all fingers – except the thumb. 6. When using a daily moisturizer, apply it with small strokes around your full face so it stimulates absorption. 7. Once a week (every Sunday), prepare a Japanese-inspired homemade mask with rice, milk and honey. Supposedly the recipe claims to help you look 10 years younger. Apply it for about 30 minutes. 8. Once a week Sunday place cold used tea bags over your closed eyes until they are no longer cold. You can store the used tea bags after her a hot tea and save on simply using them for your face. As a face cream-fanatic, my Mami has tried them all – from cheap products to the very expensive. Together we tested the new Neutrogena Tinted moisturizer, which is part of the Spring 2016 collection. Neutrogena Healthy Skin Anti-Aging Perfector, the only tinted moisturizer with vitamin-rich retinol treatment, that promises to erase away the appearance of fine lines and skin discolorations. It also protects against sun damage because it includes SPF 20 and anti-oxidants – vitamin E, natural soy and wild chamomile – for skin rejuvenation. 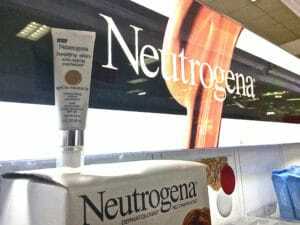 Neutrogena Healthy Skin Anti-Aging Perfector is available in drugstores for $13. *Value*: a product that combines foundation, SPF, dark spot removal plus retinol for only $13 and is available in drug stores makes us VERY happy. *Good for everyday use:* when doing errands and during the weekends, you shouldn’t have to feel – or look like you have a lot of makeup on, but after a certain age (like after 17!) you should have coverage. This is a foundation that feels light and still covers light imperfections. *Matches skin color: *It comes in 6 different shades to perfectly match every complexion. I’m glad I found this light foundation – that works a little bit better than a BB cream, due to its retinol. I’ll keep using it for everyday wear. As for my nightly routine, I have all the know-how from mami – I just need to stick to it everyday. What about you? Do you keep a nightly routine? Do you use any Neutrogena products? Let me know in the comments below. This entry was posted in #Shopping, Fashion & Beauty, For Mothers & Tias, Las Tias, Product Reviews and tagged anti-aging, Beauty Products, Neutrogena, product review. Bookmark the permalink. Chun See is right. North Buona Vista was never peaceful after I enrolled into NUS. Realignment of the road, pilling, pollution .. made it all the more unpleasant. "Just like the paid spanish protestors who did not understand the english signs they were carrying this person does not understand the talking points he qoutes. "oKAY GOOBER.How about explaining how Obama could take Steve Jobs' money and give it to poor black folks. Even if he wanted to.Take all the time you need. comunque cosÃ¬ ad occhio mi sembra difficile indovinare l'url…che poi sarebbe difficile trovare l'id utente giÃ , figurati gli altri due.Secondo me si potrebbe fare in un modo completamente diverso e piÃ¹ sociale..ma adesso non ho tempo. stasera in caso provo a fare una cosina. You have published in papers and magazines I think I remember you saying, have you written a book before or ever edited?Jim Travis kamakailan-lamang na nai-post..
comentou: Eu nÃ£o acho que o dobrar/desdobrar dela desgaste num nÃ­vel preocupante (3 ou 4 anos), o problema de seguranÃ§a pra mim nem Ã© ela dobrar no meio de um pedal, o problema Ã© que as rodas sÃ£o pequenas, pode parecer bobagem, mas no dia-a-dia, faz uma mega-diferenÃ§a, jÃ¡ vi usuÃ¡rio de bike dobrÃ¡vel tomar capote unicamente porque as rodas sÃ£o pequenas demais.Mudando de assunto: engraÃ§ado vc colocar seu nome, idade e cidade; costume de ouvir a parte de cartas NerdCast e ser trollado pelo Azaghal? Ha ha.